In the end, I didn’t extend but stayed until check out time. However after the 78th I realised about severeness of that delay. A night before I was thinking in bed about how to hit those three temples as they are positioned triangularly. Considering the distance and elevation, it seemed to me, the 81st is the first, then to the 82nd, then to the 80th is much more efficient, than usual number order. On top it would be easy to reach the 83rd afterwards. But can I really get to the 80th on time with this delay. I absolute hate surfaced flat road which very difficult to maintain the speed, contrary, as soon as I am on unsurfaced mountain road, I can have great concentration and high pace therefore I should be. I reached the 82nd around 3 o’clock. quickly finish the temple duties and got stamped. Then after I rang an accommodation to book a room near by the 80th temple. I was told by a lady that it will be too late, too dangerous to go through the mountain once it gets dark therefore I should find elsewhere near by the 82nd temple. I am not normal old retired week Japanese pilgrims, my mind set and attitude towards to this thing is nowhere near similar, there is no way back. My determination, challenge mood and the dark side are completely switched on. According to the map it is just under 7km gradual down hill mountain road. if there are no steps I could go easily way faster than the surfaced road. And actually it was way more than I was expected, nice softness of woody leafy soil with very gradual down hill. My speed went just up and up. I thought couple of times if I went to other way according to the number order 80 81 82 then it must have been harder. I was running down with smile like a mad man, until the surfaced road appeared. In the end I reached the 80th temple in just over one hour. After the 80th temple I walked pass the accommodation which refused me, I put middle finger up in my mind. Positive strong power is also coming from the dark side. 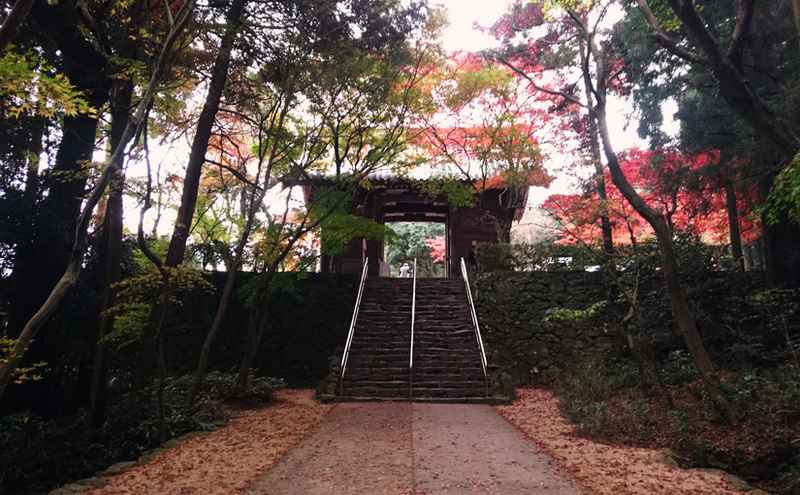 After bath I walked to the restaurant in between rice fled in pitch black, I thought that the gate of temple 82 was beautiful with autumn leaves but I only photographed one with my mobile as I was on hurry. I should have slow down a bit.